FreeFlyer® 7.4 is the next major release of the Space Industry’s most capable flight dynamics software. Create your next space exploration mission! Mission Plans executed on Linux either through the command line or the runtime API can now generate output visualizations. ViewWindow, GridWindow, ConsoleWindow, DataTableWindow, and WatchWindow output objects are all supported in this initial implementation of output support on Linux. All Viewpoint types are supported. FreeFlyer script now allows users to define Structs, which are collections of related FreeFlyer objects. Unlike Lists, Structs can contain many objects of different types. FreeFlyer Structs are designed to allow users to easily import and export JSON-formatted data. The number of elements in a List or Formation can now be increased or decreased at any time. In previous versions of FreeFlyer, users were not allowed to remove objects from Lists. FreeFlyer script now provides a reference assignment operator. Behind the scenes, FreeFlyer now has a garbage collector for cleaning up memory for objects that no longer being used. The “step” keyword is no longer necessary in the syntax for For loops. The default “step” increment is 1. The “then” keyword is no longer necessary in the syntax for If statements. FreeFlyer now supports writing of SPICE ephemerides (SPK files in the .bsp format). 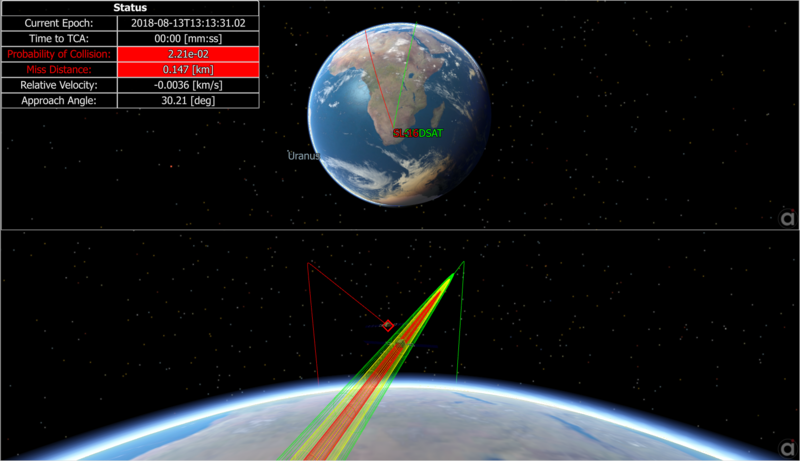 Users can now easily change the propagator and orbital elements of CelestialObjects. The CelestialObject.SetPropagatorType() method can be used to set the propagator to TwoBody, SpiceEphemeris, or reset to the default DE propagator. The CelestialObject.SetCartesianState() and CelestialObject.SetKeplerianState() methods can be used to easily set a planet or moon’s orbital state in any of FreeFlyer’s built-in reference frames. This allows users to “downgrade” the fidelity of the FreeFlyer solar system model, making it much easier to model idealized trajectories for early mission design (e.g. Hohmann transfers, CRTBP dynamics). Added support for velocity vector conversions in the Moon Fixed (Principal Axis Rotating, or PA) frame. Moon PA – Inertial at J2000 frame. Moon PA – Inertial at Epoch frame. Moon Mean Earth Rotating (or Moon ME) frame. Moon ME – Inertial at J2000 frame. Moon ME – Inertial at Epoch frame. Inertial Equatorial At Epoch frame. These new frames are supported by the PositionConvert, VelocityConvert, and PositionVelocityConvert functions, as well as methods like Spacecraft.SetKeplerianState() and CelestialObject.GetCartesianStateAtEpoch(). Added support for processing 3-way ground based tracking data where the transmitting and receiving stations are different. Improved and added additional support for processing Deep Space Network (DSN) data, including native processing of Trk 2-34 formatted data files, frequency ramping management, and range disambiguation. The timing precision mode of a RuntimeApiEngine class can now be specified in the constructor for the engine. TimeSpan objects are now a natively supported expression type that can be moved between an instance of FreeFlyer and an external application using the runtime API. The play and pause buttons on the main FreeFlyer GUI have been combined for ease of use. Added methods to easily set or get a Spacecraft’s Keplerian or Cartesian state in any built-in reference frame (e.g. Spacecraft.SetKeplerianState(), Spacecraft.GetCartesianState()). Added GroundStation.InShadow() method and Spacecraft.SubSatellitePointInShadow() method. Added Sensor.AttitudeMatrix and Sensor.ObscurationAttitudeMatrix properties to access the direction cosine matrix representing the sensor’s orientation. The SetFullCovariance method has been added to all OD estimators to support assigning the full covariance directly. The ViewWindow.MouseInteractionEnabled property has been added to disable Viewpoint manipulation for a particular ViewWindow. Added properties for PointGroup.PointOpacity and PointGroup.PointSize to control the display of PointGroups. Added GraphicsOverlay.Shapes[i].PointWidth property to control the display of GraphicsOverlay points. Added support CoordinateSystems with the literal matrix operator. The syntax [CoordinateSystem] can now be used to return a literal matrix..
Whitespace is now allowed before and after description comment slashes (///). Object.Save() can now be used in place of the Save command. Object.Restore() can now be used in place of the Restore command. Ephemeris.GenerateEphemeris() and Ephemeris.AddVectorData() can now be used in place of the Put command. Console.Write() method can now be used in place of the Report command. The UserInterface, FileInterface, FileProperties, and StringTokenizer objects are all now available in the Engineer license tier. 90 minutes of introductory FreeFlyer Fundamentals Training now available on YouTube.